Dutch process chocolate or Dutched chocolate is chocolate that has been treated with an alkalizing agent to modify its color and give it a milder taste compared to "natural cocoa" extracted with the Broma process. 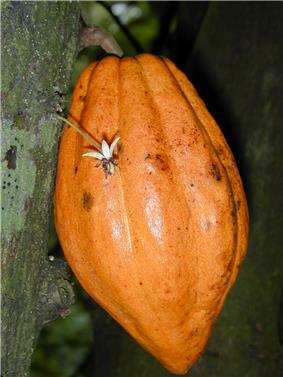 It forms the basis for much of modern chocolate, and is used in ice cream, hot cocoa, and baking. 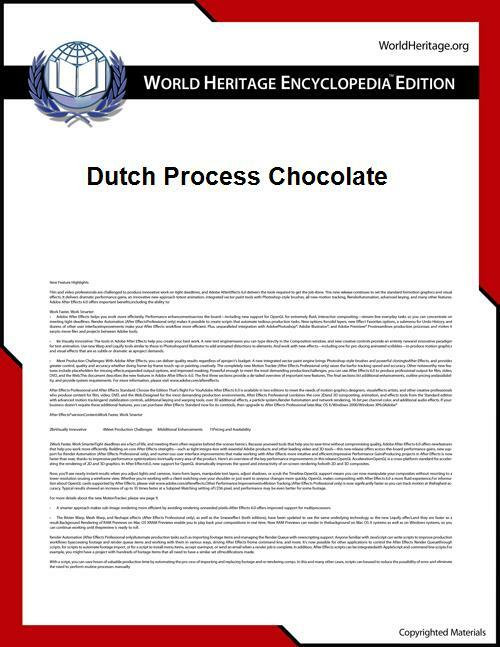 The Dutch process was developed in the early 19th century by Dutch chocolate maker Coenraad Johannes van Houten, whose father Casparus is responsible for the development of the method of removing fat from cacao beans by hydraulic press around 1828, forming the basis for cocoa powder. These developments greatly expanded the use of chocolate, which had been mostly used as a beverage in Europe until that time. Because Dutch process of cocoa has a neutral pH and is not acidic like natural cocoa, it cannot be used in recipes that use baking soda as the leavening agent, which relies on the acidity of the cocoa to activate it. Rather, Dutch process cocoa can be used in recipes that use baking powder (instead of baking soda) for leavening. Compared to other processes, Dutch process chocolate contains lower amounts of flavonols (antioxidants). The effect this has on health is disputed. Professor Dr. Irmgard Bitsch of the Institut für Ernährungswissenschaft, Justus-Liebig-University Giessen claims that the reduction of antioxidants due to the process is not significant and enough polyphenols and procyanids remain in the cocoa. One study determined that 60% of natural cocoa's original antioxidants were destroyed by even light dutching, and 90% were destroyed by heavy dutching. A new study found “...protection against synaptic deficits by Lavado cocoa extract, but not Dutched cocoa extract... since much of the polyphenol content is lost by the high alkalinity in the Dutching process." However, natural cocoa has such high levels of antioxidants that even a 60% reduction leaves it high on the list of antioxidant-rich foods. ^ a b c "Art of Darkness II: Cocoa : Good Eats". Food Network. 2009-11-16. Retrieved 2013-05-27. ^ "Cocoa Powder". Joyofbaking.com. Retrieved 2013-05-27. ^ "Chocolate Terms". Thenibble.com. Retrieved 2013-05-27. 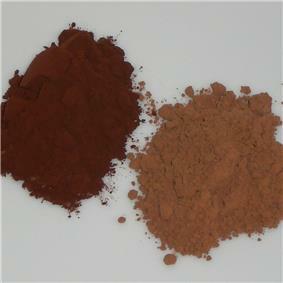 ^ "New study re-emphasizes natural cocoa powder has high antioxidant content". Eurekalert.org. 2008-10-08. Retrieved 2013-05-27. ^ "Cocoa Extract May Counter Specific Mechanisms of Alzheimer’s Disease". The Mount Sinai Hospital. Retrieved 2014-06-24.